Greasy hair is a very common problem. Mostly people apply more and more shampoo to get rid of oily hair but it is very harmful for hair. The over production of oil (sebum) in the scalp is what makes the hair look greasy. To keep oily hair under control, particular attention should be paid to your hair everyday and plan options. Go through the following lines and explore the best greasy hair care tips given here, just for you. Try to avoid, conditioner at the roots and scalp are in the middle or end. Apply gently with your fingers. Mix one tablespoon vinegar in a glass of water. Add a pinch of salt and mix it well. Rub two tablespoons of the mixture on your scalp. Massage it with fingertips. Leave it for a few minutes and rinse your hair with water. Massage your scalp gently before shampooing to stimulate its micro-circulation. Avoid brushing your hair too often or too strongly, since brushes can help you get the oil from your roots to the ends of the hair. Add 3-4 drops of essential orange, lavender or sage oil to your shampoo. These oils are perfect for Greasy hair because of their tonic and antiseptic properties. Mix one teaspoon of aloe vera gel and one teaspoon of lemon juice. Rub the mixture on your scalp and leave it on your hair for about ten minutes, before rinsing it off with water. Dry with a towel before blow-drying to remove most of the moisture. Make use of wide toothed comb for your hair. 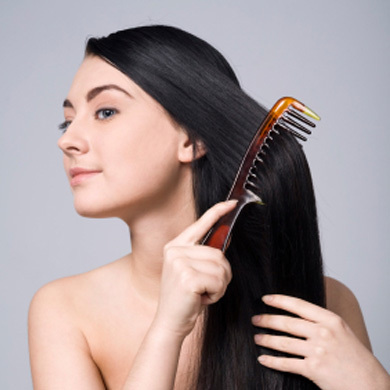 Avoid over brushing or combing your hair on a regular basis. Hope you will follow these useful hair care tips. If you want to make homemade hair conditioner then follow these recipes and made them.